phase to 3 phase, cutting covering wood, acrylic, perspect, rubber, ALUMINUIM. 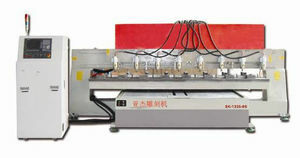 Flat table or vacuum table, air-cooling, Ucancam. blade holder at the back with original Italian spindle and Germany motor. devices that can engrave round materials and marble. Prices from R75000 to R340000. Can order smaller or bigger one from own mfn. Over 18 years experienced in cnc cutter manufacturing, own office located in Sebenza, Edenvale, Gautheng provide machine of good quality, all kinds of parts and professional service. Brand new machine with professional training and service. Free installation and training, one year free service. Cut wood and aluminum material, rubber etc. Routers can used on acrylic engraving, glass engraving, brass engraving. From the very simple design to robot-degree design, digital control, easy to operate, suitable for closed company or production line. Design on order. Will produce table size by order. From R65000. Products covering cnc routers, ATC routers, cnc laser engraving and cutting machine, cnc fiber laser cutting machine, cnc metal and non-metal laser cutting machine, cnc marble router, cnc plasma cutter for ads, cnc plasma cutter for industry, bending machine, laser marking machine, laser seal engraving machine. Provide local customers with various products and best after-sales service. are going to charge user for the service. Ruijie Mechanical Equipment South Africa office operated more than 6 years with plenty stock of machines and parts and professional technical service to serve customers in South Africa and other countries.